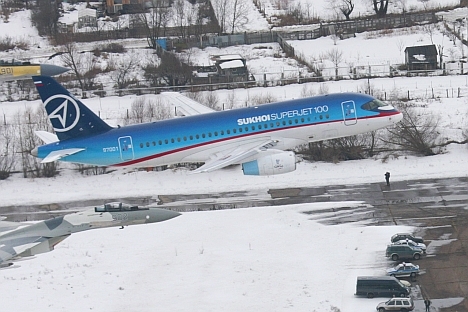 While Russia's newest regional airliner Sukhoi Superjet-100 performed its first commercial flight to Asia in late February 2013, the manufacturer still believes the regional jet’s most promising market is in Southeast Asia. Russia's newest regional airliner, the Sukhoi Superjet 100 (SSJ-100), performed its first commercial flight to Asia in late February 2013, on a route to Harbin, China. Even after a contract with the Indonesian airline Kartika fell through in March 2013, the manufacturer still believes the regional jet’s most promising market is in Southeast Asia. On February 28, 2013, a Yakutia Airlines SSJ-100 performed its first 2.5-hour commercial flight between Russia's Yakutsk and Harbin in China, with 59 passengers onboard. The day before, Superjet manufacturer Sukhoi Civil Aviation Company (SCAC) had ferried a newly built SSJ-100 to Indonesia for delivery to the local carrier Sky Aviation, which has 12 units of the model on order. Under the $380-million contract signed in 2011, Superjet International (SJI) — a SCAC partner in charge of international sales and support — will perform maintenance, repair and overhaul (MRO) services on the Sky Aviation SSJ-100 fleet for the first 10 years of operation. SJI will also train the carrier's flight, cabin and ground crew, as well as provide line-maintenance services at the airline's base in Jakarta, Indonesia. SCAC views Southeast Asia as one of the most promising markets for its regional product, and Indonesia is ideally suited for SSJ-100 operations. An archipelago of thousands of islands, many of the country's airfields have short runways. This is no problem for the SSJ-100, whose take-off does not require more than 5,905 feet of runway, experts note. Andrey Shenk, an analyst with the research provider Investcafe, also emphasizes the aircraft’s attractive price tag, which is $4 million lower than those for the rival Bombardier CRJ700 and Embraer E-175 regional jetliners. Jakarta validated the SSJ-100 certificate in late 2012, despite the tragic loss of one airframe during a demonstration flight in Indonesia in May 2012. "It is important to understand that the crash was accidental," says Alexei Sinitsky, chief editor of the Russian industry publication Air Transport Observer. "It had nothing to do with the airframe and occurred away from civilian airways. The disaster might have resulted in certain reputational losses [for the manufacturer], but these would be negligible in the eyes of the professional community." Still, the expected signing of contracts for up to 40 airframes with Southeast Asian carriers did not materialize in late 2012. "The curtailed demonstration tour [of the region] resulted in several protocols of intentions but no firm contracts," says Oleg Panteleev, chief analyst at the AviaPort.ru web portal. Most recently, in March 2013, the $900-million contract to sell 30 SSJ-100s to the Indonesian carrier Kartika Airlines might have also fallen through. Russian media reports suggest that the airline has ceased operations and stopped selling plane tickets. Russian industry experts point out, however, that the uncertain status of the Kartika order is actually playing into the hands of SCAC. The manufacturer's production capacity is already completely full for the next three years, and delivery rates have been slipping. Now the company will get a chance to sort out its delivery schedule — something its existing customers are sure to appreciate, says Panteleev. Sales of SSJ-100 models may receive a fresh boost with the help of Lithuanian MRO-provider FL Technics, which signed a MoU with SCAC in late February 2013 to become a partner in the SJI network of authorized, airframe service-centers in Europe and Asia. The company's immediate task will be to provide the SSJ-100 with line-maintenance support in Southeast Asia. "FL Technics is expanding fairly aggressively, and its customer base is growing dynamically," says Panteleev, "It is a definite asset to the [SSJ-100] program. The Lithuanian provider employs highly qualified personnel, it has its own MRO base in Europe and interests in several regions; all of these factors could be successfully applied to servicing the SSJ fleet." Panteleev explains that carriers stock the most essential spares at their home bases, while estimated delivery times from European pools for parts with lower failure rates do not exceed 72 hours. Mikhail Pogosyan, president of Russia's United Aircraft Corporation (UAC), announced last year that SSJ-100 production could be partially outsourced to Indonesia. "We could be talking about some small sub-assemblies of the fuselage and empennage," he said, adding that Indonesia might also become involved in other aspects of airframe assembly work. "Indonesia's level of technical development is quite high," says Sinitsky. "With proper control in place, quality should not be an issue. [Such cooperation] could really help promote [the SSJ-100 in the region], particularly in Indonesia." Experts had difficulty estimating the possible share of SSJ-100 work Indonesia could receive. AviaPort.ru's Panteleev does not think it will be significant. So far, the only Indonesian company known to have been approached as a potential Superjet supplier is PT Dirgantara Indonesia/Indonesian Aerospace. Panteleev also notes that joint programs to set up MRO networks for the equipment being purchased represent a more typical offset scenario than outsourcing work on the airframe to the customer's country. The SSJ -100 is not entering the global market at the most propitious time, says Investcafe's Shenk. The recent plunge in passenger numbers on major routes has left many air carriers in poor shape. The UAC Superjet order-book currently stands at 179 units, worth a total of $5.4 billion in list prices. One SSJ-100 is already being operated in Asia by Lao Central Airlines of Laos. Talks are ongoing with potential customers in Europe, Asia, and the Americas. The only tangible development at this point seems to be the upcoming finalization of an order for 24 airframes from the Russian carrier UTair Aviation. "SCAC is not naming any other contracts that could be signed in the immediate future," says Panteleev.